NEW INDEPENDENT FIGURES show that the circulation of all Irish newspapers bar two fell in the second half of last year. 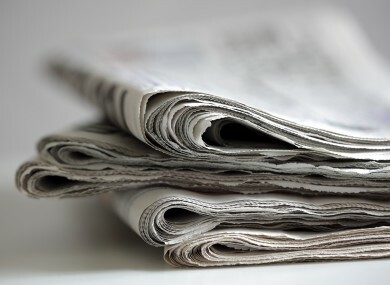 The latest numbers from the Audit Bureau of Circulations (ABC) show that all daily national papers saw declining sales in 2015, with only the Irish Sun and Sun on Sunday recording a slight increase. Circulation of the Irish Times dropped to 74,092, compared to 76,194 in the first half of the year – a fall of 2.8%. Sales of the Irish Independent have also dipped, though by a lesser margin – its fall from 109,524 to 108,460 represents a 1% drop. The Independent’s sister paper, the Herald, also posted a fall in circulation, from 48,133 to 44,317 over the course of 2015. The Irish Examiner saw its sales decrease by 1.7% from 33,198 to 32,648 in the same period. Most daily tabloid papers also recorded falling figures. Circulation of the Irish Daily Mail fell by 8% from 50,037 to 46,028, while Irish Daily Mirror sales dropped by 6.8% from 43,250 to 40,300. The Irish Daily Star sold an average of 55,408 copies in the second half of 2015, down 4% on the first half of the year, when sales averaged 57,658. However, the Irish Sun saw its numbers rise by 1.3% from 57,702 to 58,463. The Sunday Independent remains the highest-selling paper in the country, with sales of 211,856 – a decrease of just under 1% since the first half of 2015, when it sold an average number of 213,549 copies. The Sunday Business Post had a circulation of 32,162 in the second half of the year, compared to 32,948 in the previous six months – a fall of 2.4%. Sales of the Sunday Times dropped by 3.3% from 82,748 to 80,023. The Irish Mail on Sunday also saw its circulation dip, falling by 4.3% from 90,105 to 86,191. The Irish Sun on Sunday was the only Sunday paper to record a rise in circulation, increasing its sales by 4.9% from 53,047 to 55,779. Email “Bad news for most Irish papers as circulation figures continue to drop”. Feedback on “Bad news for most Irish papers as circulation figures continue to drop”.